There are many different routes you can go in regard to kitchen design. This being said, many people have to ultimately make the decision between a rustic kitchen and a modern kitchen, as those are the categorizations that many people make in their minds. If you are looking for a more modern kitchen, there are a few things you can do to take your kitchen to the next level and modernize it a bit, without spending money on a full home remodel. Countertops: Adding new countertops can be a bit expensive, but is really a great way to create a whole new atmosphere in your kitchen. By going for something a bit sleeker, you have the opportunity to transform your kitchen area into the more modern look you are going for. A monotone stone, in a black, white or gray color, will achieve this look. Declutter: Modern kitchens are known for their lack of ornamentation, so making sure all countertops are cleared, and all other areas highly organized, you can get the more modernized feel. If you do want to add accent pieces, it is essential that they are all consistent, or it will throw off the kitchen. Faucet Swap: Swapping out your faucet for a thinner, high-arc faucet can really put your kitchen over the edge in regard to modernization. French Door Refrigerator: New appliances are sometimes a possibility, and French door refrigerators are very popular right now. This being said, getting one of these in a stainless steel can be a great addition to your kitchen. Skylight: Skylights can help to add a bit of light that you wouldn’t normally get. This is because natural light truly is the best light and a skylight can help make your kitchen a bit softer and brighter. Sleek, Simple Hardware: One of the biggest trends of the recent years is adding industrial elements to a kitchen. This could include stainless steel appliances and sleek stovetop areas. 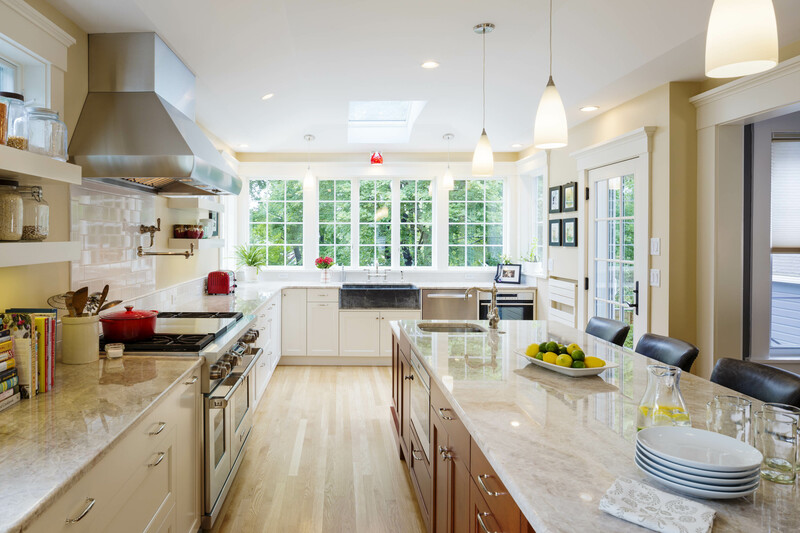 For more information on modernizing your kitchen, feel free to contact us by filling out our contact form, or contact us directly by calling 508-875-4004.